mykenoshacounty.com – See ewe at the fair! See ewe at the fair! 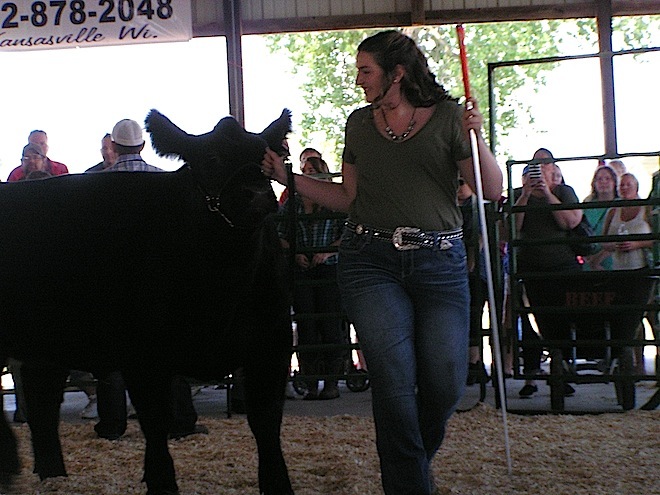 Jordyn Schultz, of Brighton, showcases her grand champion steer she calls Houdini in the 2017 livestock auction at the Kenosha County Fair (Jason Arndt/The Report). The annual five-day event will deliver tunes from local bands, exhibits for people of all ages, shows in the grandstand, and much more. From bluegrass to classical music, the fair promises to deliver a diverse range of talent, which include some returning favorites. Performers scheduled to appear on the Creekside Stage include DJ Nick D, KR Bluegrass Band, Gooroos, Burro Creek, The Now Band, Doo Wop Daddies, Bella Cain, Amazing Farm Boys, Class of ’62, among other acts. For specific times and dates, visit kenoshacofair.com. Some of the traditional countrified fair entertainment includes animal shows, a hay bale throwing contest, garden tractor events and engines roaring on the Wilmot Raceway. In the grandstand, the fun starts Aug. 15, when Digger Doug plans to conduct the third annual ATV/UTV Showdown. The event starts at 6:30 p.m.
Digger Doug, a 20-year pro ATV/UTV rider, plans to showcase high-flying, mogul-jumping stunts. For race fans, the highlights on the Wilmot Raceway include the IRA Outlaw Sprint Series and the WingLESS Sprints and Bandits at the grandstand. Gates open at 5 p.m. on Friday and Saturday with racing beginning at 6:45 p.m. There is an additional $7 fee to attend the races. Throughout the fair, there will be an Antique Farm Machinery Exhibit, which offers guests a glimpse into yesteryear. See the old tractors, engines, and machinery from a time gone by. There will be an antique tractor parade on Thursday, Aug. 16, at 5 p.m., when the models of yesterday venture throughout the fairgrounds and grandstand. The county fair and kids go hand-in-hand and there are plenty of kid-friendly activities to keep families busy throughout the entire run. The annual Children’s Parade steps off at 10:30 a.m. on Friday, Aug. 17, at the southeast end of the fairgrounds, near the fair office. Onsite registration begins at 9:30 a.m. The fair has an all-pay policy. Everyone who enters the fairgrounds must pay the daily admission price. Tickets cost $10 for adults ages 12 and up, $5 for children ages 7 to 11 and free for children 6 and younger. The cost for seniors 65 and older is $7. Season passes are also available for $35 for adults and $12 for children. The fairgrounds will open 8 a.m. and close midnight Wednesday through Saturday, and from 8 a.m. to 7 p.m. on Sunday. For more information, see Southern Lakes Newspapers’ special section by clicking here.